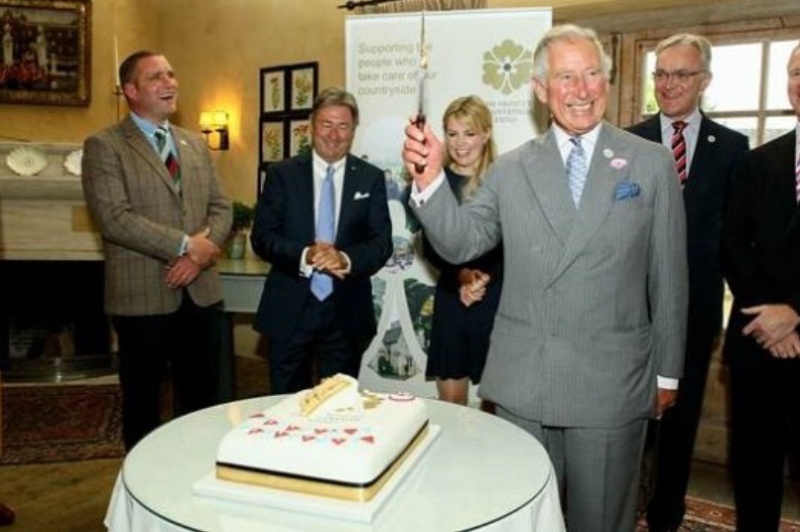 His Royal Highness The Prince of Wales Celebrates 5 Years of The Prince’s Countryside Fund. On Friday, July 24, 2015, His Royal Highness The Prince of Wales hosted a garden party inside the Orchard Room at Highgrove House in Gloucestershire to celebrate the 5th anniversary of The Prince’s Countryside Fund (PCF). “…presented with a handcrafted cake to celebrate the ‘birthday’ of the Fund, made by Fiona Cairns, who made the royal wedding cake for the Duke and Duchess of Cambridge. The cake was cut by HRH, surrounded by his ambassadors. The Prince’s Countryside Fund, founded by HRH The Prince of Wales, was set up following his long held commitment to ensure a sustainable future for rural Britain and has celebrated its fifth anniversary during National Countryside Week (20-26th July). In the five years since its inception, the Fund has distributed over £6 million in grants to 135 projects benefiting 160,000 people living and working in our rural communities. During National Countryside Week a further £800,000 of grants has been allocated to rural projects across the UK. Members of the Danish Royal Family Witness the Changing of the Guard. On the afternoon of Friday, July 24, 2015, Her Majesty Queen Margrethe II and HRH Prince Henrik of Denmark accompanied by Their Royal Highnesses Crown Prince Frederik and Crown Princess Mary of Denmark along with their four children, Her Highness Princess Alexandra of Sayn-Wittgenstein-Berleburg and Count Jefferson von Pfeil und Klein-Ellguth along with their two children witnessed the changing of the guard at Gråsten Slot in southern Denmark.